The second Portraits in Otherness programme curated by Akram Khan and his company producer Farooq Chaudhry featured two new works created and performed by company dancers Chien Ching-ying (簡晶瀅) and Joy Alpuerto Ritter, who both made such an impact with Khan a couple of years ago in his Until the Lions. The inspiration for Vulture by Taiwanese dancer Chien comes from the thought that nobody ever sees the body of a deceased vulture, and an old regional myth that says when a vulture knows it is close to death, it flies high towards the sun before melting into nothing. Chien also ties the idea into the Greek myth of Icarus and Daedalus, of man imitating nature and failing. Totally integral to Vulture is composer and musician Joseph Ashwin (also on the Until the Lions team). It opens with him standing, back to the audience, in a huge black cape. As he slowly steps away, the massive train of fabric spreads to reveal an amorphous shifting shape beneath it. When she is finally revealed, Chien appears a mix of human, avian and alien. Her dance is contorted, frequently with hands linked behind her back, her arms appearing as wings. 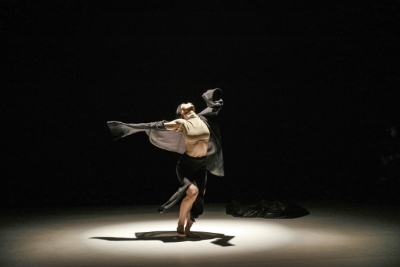 While there are moments of freedom, Chien’s dance is largely intense and tightly bound. Her dance shifts from smooth to accented and jarring. Despite those arms looking like wings, it is an evocation of inner feelings rather than a physical description. Attaching meaning is difficult at times, yet she has such a remarkable presence that one dare not shift the attention for a moment. Striking images constantly appear from nowhere. When Ashwin, after producing many glorious and occasionally strange sounds from his guitar joins Chien on the floor, she winds her body sinuously around him as he references Icarus in spoken text. Later, and alone once more, she lays on the floor arching her upper body in an exquisite curve before reaching up with her arms and legs as if floating on air. Quite simply, gorgeous. L.A. born Ritter’s BABAE is inspired by Mary Wigman’s Witch Dance. Anyone familiar with the surviving clip of Wigman performing her “masterpiece of strangeness” as it was called will spot the links immediately. The incantatory hand gestures and scuttling around the stage are all there. Like Chien, Ritter is a compelling performer. The detail in her movement is remarkable. Initially she moves purposefully between five pots, initiating a light in each, as if getting ready for a ritual, before seating herself on the floor, her hair covering her face. Vincenzo Lamagna’s percussive score accompanies the dance, matching the sometimes frenzied, sometimes calmer movement. As she shifts between the animalistic and sensual, between ritual, trance and the everyday, Ritter also hints at her classical training but especially hip hop and voguing. Whereas it was Chien’s whole body that spoke, in BABAE the focus is on the limbs. Ritter’s hands hold a conversation with each other, chattering away at speed and yet always with great clarity. Maybe it was the birdsong in the score, maybe it was the movement itself, but it felt like two songbirds. Slowly but surely the intensity of the dance builds with more agitated, hexing gestures working their way in. Ritter hunches over, rocks her body and lurches across the floor still in her seated butterfly position. After eventually rising to full height (written accounts of Wigman’s dance suggests she did something similar), she returns to one of the pots, tossing red glitter over herself. It’s not exactly ecstatic, although there is a sense that this is the climax of whatever strange rite we are witnessing. Unfortunately, it also holds the attention fare less well than what went before. The climax of the ceremony over, she leaves as calmly as she arrived. Portraits in Otherness has proved an exciting and hugely impressive look to the next generation of choreographers. As the title of the season suggests, all four works demonstrate the ‘otherness’ and individuality of the performers. All are also extremely powerful, and beautifully staged and lit. They did not feel like emerging choreographer works. Vulture and BABAE are also near perfect length. I do hope the choreographers are not tempted or persuaded that extending them would be a good idea. Khan and Chaudhry are to be hugely congratulated on the initiative, which one hopes will be repeated. It will also be fascinating to see where these dance-makers go next.